Welcome to Tustin Grove! This gorgeous 3 bedroom 3 bathroom single family home is Move-In-Ready with newly installed laminate flooring, carpet & paint inside. This gorgeous open floor plan offers a spacious kitchen that opens to the dining room, living room & backyard, perfect for entertaining. Living room features a cozy fireplace, cathedral ceilings & cute powder room for your guests. Upstairs offers 3 bedrooms, 2 bathrooms and spacious laundry area in hallway. Master suite features dual vanity, soaking tub with shower and an oversized walk-in closet. Direct access to large two car garage. Charming front porch and wrap around back patio offering new landscaping. Gated community featuring a pool, spa, & childrenâs play area. Award winning Tustin Unified. 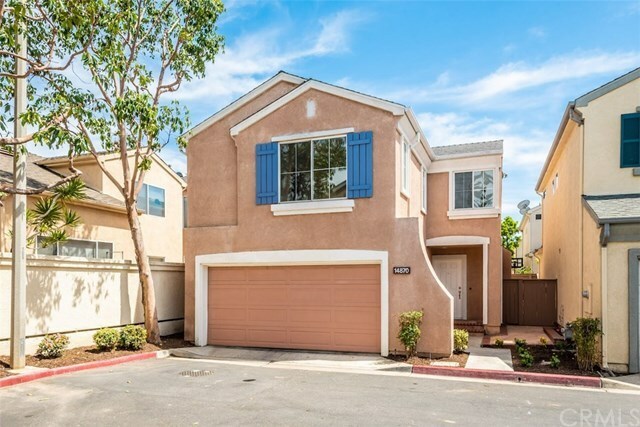 Conveniently located near Shopping, Tustin Market Place, South Coast Plaza and freeways!